Maximizing cost effectiveness is every builder’s goal and every home buyer’s expectation. Each year, an impressive group of builders is recognized by the U.S. Department of Energy (DOE) for their forward-thinking approaches to delivering Zero Energy Ready homes. The most exemplary of the annual winners achieve this extraordinary target while keeping costs in line. 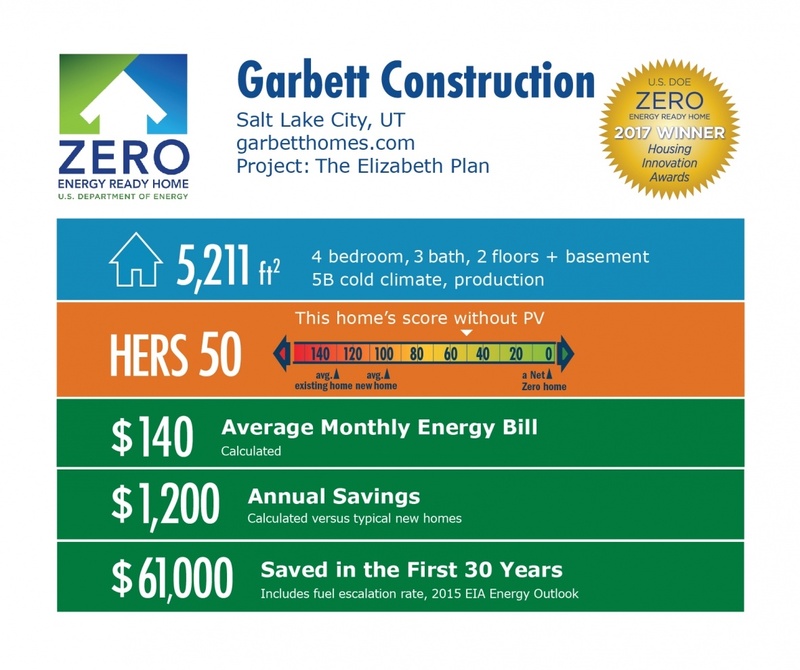 Utah-based Garbett Construction is a 2017 Housing Innovation Award winner, and its winning Elizabeth model delivers notably affordable high energy performance, using proven energy-efficient construction practices and economical blown-in fiberglass insulation. Advanced framing and raised heel trusses are key aspects that that helped the builder deliver the stellar energy performance of that model. The advanced framing with 2x6 24-inch on-center construction allows more space in the cavity for blown-in fiberglass insulation. Raised heel trusses in the attic allow for full-height insulation without compression at the top wall plate. Effective air sealing is essential to delivering an air tight, high-performance home. A major point of leakage in any home is the connection between the bottom plate and the slab or floor system. In the winning home, the top and bottom plates, as well as the rim joists, are air sealed with spray-applied sealant (top and bottom plates) or spray foam (attic rim joists). The home’s walls are filled with R-23 blown-in fiberglass and the attic with R-60 blown-in fiberglass. The combination of strategic air sealing and dense packed blown-in fiberglass helps deliver an impressive 1.3 ACH50 blower door test result and a Home Energy Ratings Score (HERS) of 50. The HERS 50 score means the home is 50 percent more efficient than a home built to the 2006 IECC and 80 percent more efficient than the average resale home. 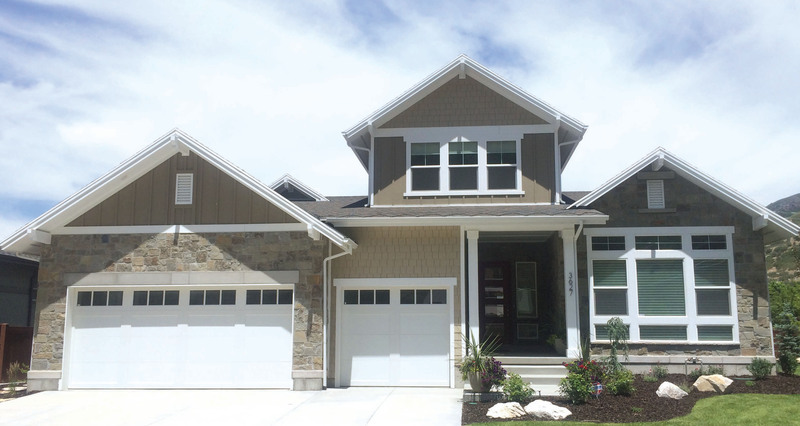 Garbett Homes’ win demonstrates that builders can meet high-performance targets like Zero Energy Ready utilizing basic building science knowledge (like where homes leak the most air) and more cost-effective products, like blown-in fiberglass. Since 2013, the Department of Energy’s (DOE) Zero Energy Ready Home program’s Housing Innovation Awards have recognized over 100 homes across the country from the nation’s leading builders for providing American homebuyers with homes that live better, work better, and last better. Housing Innovation Award winners represent the very best in innovation on the path to zero energy ready homes. Earning an award not only provides you the distinction of a national award from the Department of Energy, but also includes considerable recognition. To learn more about the Housing Innovation Awards and to apply for the 2018 awards, visit the DOE’s web page.